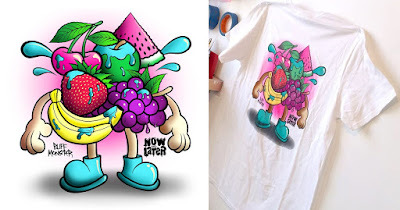 Buff Monster recently created some artwork for Now and Later Candy's current sweepstakes, which will ultimately grant one lucky fan a grand prize of a year’s worth of Now and Later Candy! But what’s really awesome about this sweepstakes is that twenty first prize winners will receive a Now and Later t-shirt designed by Buff! It’s a totally awesome design, right!?! To enter, post an image on Instagram of how you dare to be original, along with the hashtags #DareNowAndLater and #Sweeps. The Now and Later Candy sweepstakes ends at 11:59:59pm CST on March 21, 2018. You can read more about sweepstakes and its rules here.